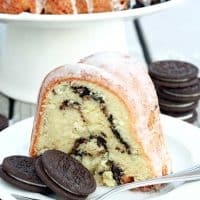 COOKIES AND CREAM POUND CAKE — A moist, tender vanilla pound cake infused with a ribbon of chocolate sandwich cookies and finished off with a powdered sugar glaze. I have a confession to make. I’m not usually a fan of cookies and cream themed desserts. I know. There’s definitely something wrong with me. But I do love Oreos, and pound cake. 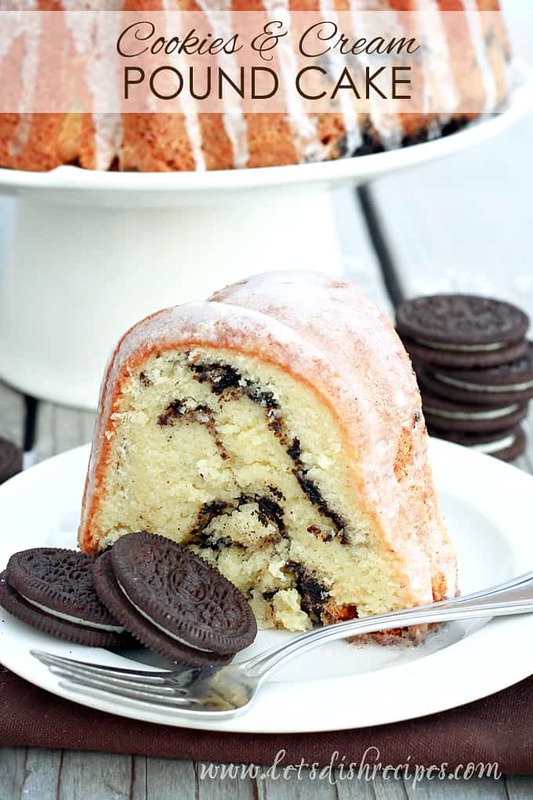 Which might explain why I thought this Cookies & Cream Pound Cake was so fabulous! The cake is perfectly dense and moist, just like a good pound cake should be. And adding Oreo crumbs to just about any dessert is always a good idea! 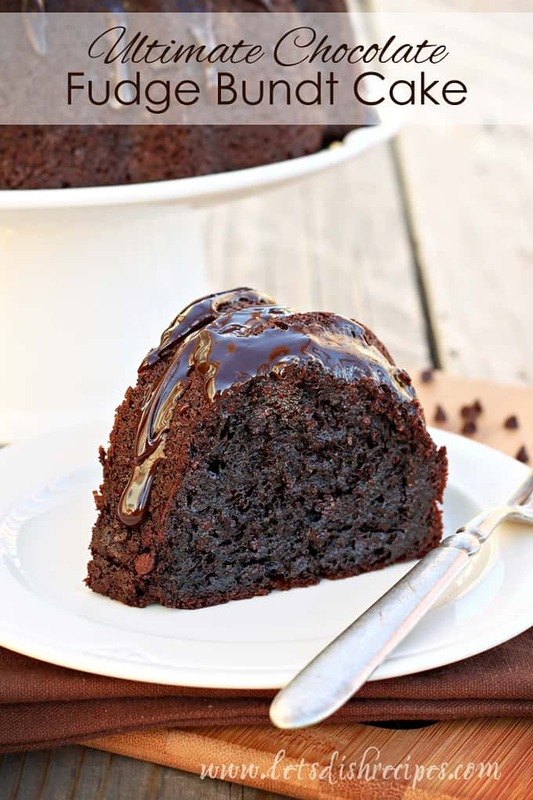 You definitely need a large bundt pan for this cake–twelve cups at the very least. If your pan is smaller, you can still make the cake, you’ll just want to use less of the batter. This is truly one of the best cakes I’ve made in a long time. It does feed a crowd though, so unless you can resist the temptation to finish the entire thing off by yourself, I’d recommend inviting some friends over to share. Trust me, that’s an invitation no one will turn down! A moist, tender vanilla pound cake infused with a ribbon of chocolate sandwich cookies and finished off with a powdered sugar glaze. Preheat oven to 325 degrees. Grease and flour a 12-15 cup bundt pan. In a large bowl, beat butter and sugar at medium speed until fluffy. Add the eggs, one at a time, beating well after each addition. Add the flour alternately with cream, beginning and ending with flour. Beat until just combined after each addition. Spoon half of batter into prepared pan. Top evenly with half of crushed cookies. Using a butter knife, gently swirl the crushed cookies into the batter. Add the remaining batter to the pan and top with remaining crushed cookies. Using the knife, swirl the cookies into the batter again. Bake for 1 hour and 10 minutes to 1 hour and 20 minutes, or until a tester comes out clean. 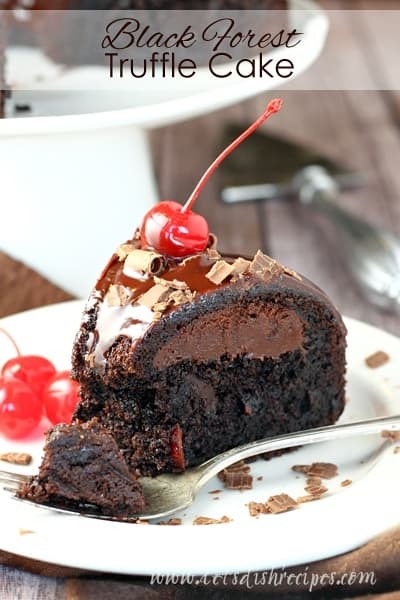 Allow cake to cool in pan for 10 minutes. Remove from pan and cool completely on a wire rack. In a small bowl, whisk powdered sugar and milk until smooth. Drizzle over cooled cake. I am so making this, Danelle! I love cookies and cream and this Paula Deen recipe looks amazing. Thanks for sharing. Yum! That cake looks great – so moist and delicious. Thanks for sharing! Sounds delicious! I love anything with Oreos in it! I wonder how it would taste with different flavors of Oreos? Maybe I can try the red velvet ones for Valentines day! Thanks for the recipe! How about the milk? When shall it be added? My husband is making this right now. I am sooooooo excited. I will post again when it’s done. I don’t know if I understand your question correctly, but the butter and sugar will not become smooth. It will look a little bit like sand. The amount of sugar is correct, as is the amount of flour. It is a thick batter, so you need to use all the flour, even if it seems like too much. Nope. But that is not unheard of for a pound cake. Thank you for this recipe. It is now my husband’s favorite. He keeps asking me to make this again and again.